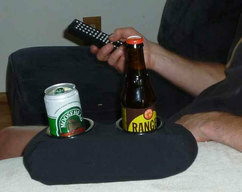 Safely set your drink down anywhere. No more tips, spills or accidents! 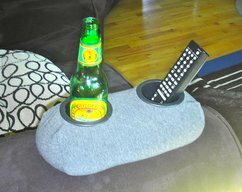 No more wedging your drink between cushions, holding it in your lap or setting it on the ground to be accidentally kicked over. 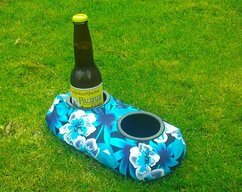 The Beverage Bandit can be placed anywhere you want to set your beer or soda: Recliner armrests, sloping hills at outdoor concert venues, truck tailgates, the possibilities are endless. Those plastic, between-the-cushion cup holders are one-dimensional and spill their contents when you get up or sit down. 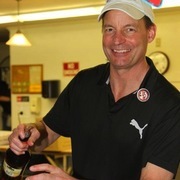 Each hand crafted Beverage Bandit has an adaptable, heavy bean bag base that contours to any environment and keeps your drink upright. Its non-slip grip base will keep the Beverage Bandit stationary even on slick leather and vinyl surfaces. 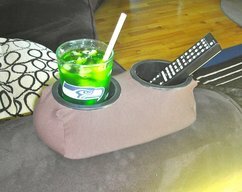 Twin cup holders securely hold drinks for you and a friend or use the extra holder for your remote or cell phone. Perfect for beer, soda, water bottles, disposable 16oz coffee cups, etc. 3- 5/8" wide x 3" deep. Holds pounders, cocktail glasses, beverage coozies, and just about everything else!